"be aware of the late payment penalty charges"
Hello, I am Miss Young. I received this story about a fake lottery from a friend. Let me call him Roy. Go to the homepage to see more stories. I thought it might be too good to be true, but hey when your unemployed and desperate for money, they make it seem so real and worth pursuing... Glad I found your site. If you like, I will attach a few documents that they sought to dupe me with and you can add too your exstensive collection. You can see how unprofessional the Bank Form is, and this should have been my first indicator. * First Email - YOU HAVE WON! Category "A" draws of TRIPPLE WINS INTERNATIONAL GAMES. winning payout for Category â¤½winners. remittance of your prize money to a designated account of your choice. part of our promotions program. Upon receipt of the duly requested data, I will send you the contact information of the paying Bank so you can proceed with affecting the release of your claims. Note: This Lottery was won via a selection of email addresses, which yours was selected and qualified you as a winner. Any funds unclaimed before our next draw, which is on The 28th of December 2006, shall be returned to this office as unclaimed and used for our up coming mega jackpot games. I acknowledged your claims form information. We have created a file in your favor and the file was forwarded to the British high court for appends. The court has approved your winnings and hence the winning certificate has been drafted and the probate registry has witnessed the approval. Kindly note that a copy of the Original of your winning certificate will be sent to you via fax as soon as possible and the original of the certificate with other relative documents from the court and the probate registry, has been forwarded to the Bank for onward Transfer of your winnings. Kindly contacts the Paying Bank give them all your winning combination codes and numbers as reference for them to be able to attend to your claims. We have just received your email and content understood. You complain about the account opening fees of $10,000.00 you were asked to pay. Please do take note that the fees you are paying will be credited to your Lottery Funds before we effect the transfer. Also note that we are only following the Banking procedure to finalize this transaction. However, another option we have for you which is affordable is sending you a certified check. 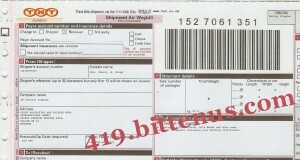 Note that the check will be sent to you via a courier service, which the cost will be bourne, by you. However, the cost of delivery of the certified check, winning gold medal and other documents costs only $2,511.95 only. I think this option is best suitable and convenient by you since its far cheaper compared to opening an account with us. Please do get back to us ASAP so that we can give you the courier company contact as we have already taken your documents including your certified check to them for onward delivery to you. We do await your swift response. We have just received your email and content noted. However, we have sent a Certified Check to the TNT Courier Company here in United Kingdom so that they can deliver it to you since the cost of delivery is cheaper compared to opening an account with us. The delivery costs $2,551.00 only. You are therefore advised to contact the TNT Courier Company via the details below so that they can deliver your parcel to you. Also inform us as soon as you have received the parcel. Please do contact them as soon as possible as you know that the Lottery Company will be going on Christmas vacation by next week. Also inform us as soon as you have heard from the TNT Company. We are sorry for the delays. This was because of the New Year events. We have just resumed office. We received your email. We have a copy of the airway bill to verify that we have your parcel in our custody. Please note that we cannot deliver your parcel not until we have received our delivery fees of $2,511.97 to get the parcel delivered. Also take note that we will start counting demurrage charges of $50.00 per day starting from next week Thursday is this parcel is still in our custody. Finally, you are therefore advised to pay our delivery fees via Western Union Money Transfer to our delivery officers Name and Address below. Address: 466 Barking Road, London. Send us a copy of the payment receipt via email attachment as soon as the fee is paid so that we can verify your payment. We do await your prompt response. Thanks for the response. As soon as you pay the fee, do inform us and also be aware of the late payment penalty charges. For the record, I went too the TNT UK website and attempted to track the item number listed on the receipt, and it apparently (surprise surprise) doesnt exist.